You may have noticed, like me, that the cherries have been on sale an awful lot this summer. You'll hear no complaints from me as they're one of my favorite fruits that I don't usually splurge on because of their high price per pound. With all the recent sales I've been experimenting with new cherry recipes - and not just sweet ones! I tried making a cherry relish - the original recipe I looked at didn't call for any cooking - just chopping and mixing, but I thought the flavors might come together more if they were slightly cooked. 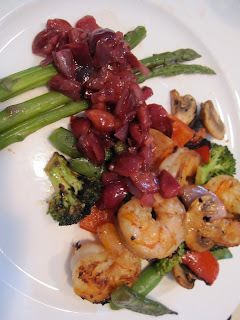 I made this Shrimp and Vegetable Stir Fry with Cherry Relish and Asparagus and the flavors worked pretty well together. I just tossed the shrimp and vegetables with a pretty basic mix of olive oil, salt and pepper - put on the grill and served with the cherry relish. A very healthy summer meal with lots of flavor! You don't have to be too accurate with the ingredient amounts in a relish because you don't really have to worry about the consistency changing. I was surprised to see that a relish is defined as simply "a condiment, appetizer, something savory or appetizing added to a meal." In my cherry relish I had diced fresh cherries (of course! ), diced red onion, fresh ginger, garlic, salt and pepper, and maybe a little olive oil and juice - like a citrus, lemon, lime or orange. The biggest part of the process is pitting the cherries, which is not fun and dyes your hands red. Just goes to show that cherries can be used for cooking savory dishes, and not just sweet ones! Once a year we have a lobster and steamer feast - we never really understood people that enjoyed ordering steamed lobsters in restaurants. It's such a messy meal which makes it much more enjoyable in the privacy of your own home. We had our lobster night yesterday, given the nice long holiday weekend - and it was a delicious night of cooking in! Steamers dipped in melted butter, steamed lobsters, grilled vegetables and pasta salad. Perfect summer night. I must have eaten too many steamers or something because by the time I had cleaned my lobster (I always start with the legs and smaller pieces, working my way up to the delicious claws and tail - much larger pieces!) - I wasn't even hungry anymore. A good solution though - I saved some of my lobster meat and used it today to cook this delicious dish. Farmers Market = Tuesday Ravioli Night! After visiting the Harvard Farmer's Market on its first Tuesday this summer, my coworker and I decided we should institute Tuesday Ravioli Night into our schedule. Unfortunately our schedules didn't really allow us to maintain this sort of weekly dinner ritual - but rather we managed to have just one 'Ravioli Night.' We tried a package of Swiss Chard and Currant Ravioli from Nella Pasta, based in Jamaica Plain. The raviolis were very good, we agreed, but we also agreed that the price was a bit high for the 2 serving package ($11). Compared to going out to an Italian restaurant, yes, less expensive for sure. The woman working at the Nella Pasta stand at the farmers market suggested simply tossing the ravioli with a little bit of olive oil, but that clearly wasn't going to cut it for me! The ravioli were a good size, and the easiest thing to mess up is overcooking them. Because it's fresh pasta they cook much quicker than you expect - just 3 minutes or so. We tossed with more than the olive oil - diced fresh tomatoes, zucchini, some fresh parmesan, trying to keep in mind that with such a unique flavor filling inside we didn't want to over do it. The end product was delicious - and filling. I would definitely get these ravioli again - a lot of the times when you buy fresh ravioli at the grocery store all of the flavors taste the same, but you could definitely taste the swiss charge currant filling in these. They also try to keep their ravioli varieties according to season, which is such a great idea - for a list of other kinds, check them out here! Amongst the spring and summer varieties - I can't decide which I'd try next, they all sound delicious!